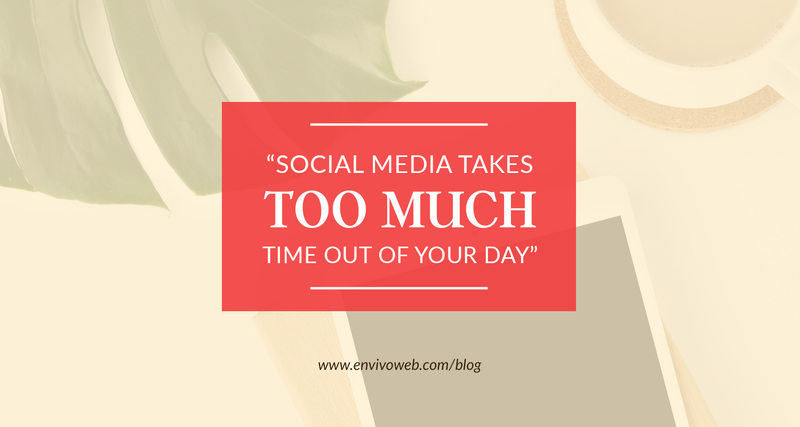 This is one of the most common complaints I hear about social media and one of the biggest excuses solopreneurs make to not be on social media. In the same breath, I hear them express that they understand how powerful social media can be and really want those results for themselves. But “it just takes so much time”. Ready for the truth? Yup. It does take a lot of time. The good news is that you really do have the time. First, let’s acknowledge the fact that social media can be hugely transformational for your business. Where’s the other place you can generate leads? Offline at events and meeting people one-on-one (both online and offline). These activities take a LOT of time and the number of people you can meet is very limited. Say you go to a networking event. It takes about 45 minutes to prep to go. Then 15 minutes to drive there. The event itself is 1.5 hours. Then 15 minutes back to your house. Another 15 minutes to settle in. That’s 3 hours to attend one event. How many people do you actually meet at a networking event? Let’s say 15. Are they all ideal clients? No. And for those who aren’t ideal clients: are they good referral partners? Not all of them. And for those who are good referral partners: how often will they refer good business to you? We don’t know. Imagine that if in that 3 hours, you create a few pieces of content and engage on social media. You have the potential of getting in front of so many more people and outside of your local area. As you are consistent over time with creating quality content and engagement, your results will grow (sometimes exponentially). Let me note that I’m not saying you shouldn’t go to events offline. I love going to networking events and conferences! Some of my best clients have come from events like that or as referrals from people I met at those events. But if you are saying social media takes too much time but spend about 3 hours going to one event to meet 15 people, something has to change. Here’s what you and I can both agree on: solopreneurship means you wear a bunch of hats. That means you’re being pulled in several directions. You have to do the admin, the business development, lead generation, sales, client fulfillment. I know it’s hard to do it all. But it is possible. There are so many leaders in the entrepreneurial space that started as solopreneurs. And they say that played a role in their success in growing 6- and 7-figure businesses. You need to be super intentional and laser-focused with how you spend your time. That’s how you’ll be able to get it all done. It starts with evaluating how you spend your time already. Here are some time wasters you can look at. According to comScore’s 2017 Cross Platform Future in Focus report*, the average person spends 2 hours and 51 minutes on their phone every day. How long does it take for you to get up in the morning? Do you roll around in bed for half an hour before getting up? What about when you go to bed? Do you roll around on your phone for an hour before actually attempting to go to sleep? If so, stop both habits. There. You’ve saved 30-90 minutes. Look at the events you typically go to. Do you get a good return-on-investment with your involvement with them? If not, then stop going and spend that time productively in your business. How many hours a day do you spend working on your business? I know a few people who don’t have other jobs or major obligations who spend less than 40 hours a week on their business. I highly recommend tracking your time using a simple spreadsheet. Every time you start a new activity, record the time. When you stop, record the time. Rinse and repeat all day. Then see how much time you spent working. I guarantee that if you do this work to evaluate your life and see the reality of how you’re spending your time, that you’ll find at least a couple of hours per week (if not way more) that you could be spending growing your business. That includes spending a couple of hours on social media. There are many ways you can create content and build a strong following on social media efficiently with your busy schedule. I’ll share that in next week’s post. Follow me on Facebook and Instagram to hear when the blog post goes live.